In this next post, I want to cover how to cook dandelions, and go over some of my favorite recipes. Most of these recipes are virtually free when it comes to expenses, especially given the fact that dandelions grow wild in many of our backyards, and for those of us who don’t have dandelions growing, they are inexpensive to harvest. First, let me start by reiterating a point I made earlier: the older a dandelion plant gets, the more bitter it’s going to taste. Its age, therefore, will guide you on how it’s best cooked. For example, young dandelion greens can be eaten raw on salads. On the other hand, older greens (which are always larger in size) should be blanched or steamed to remove the bitterness. This is hands down my favorite way to eat dandelion greens. 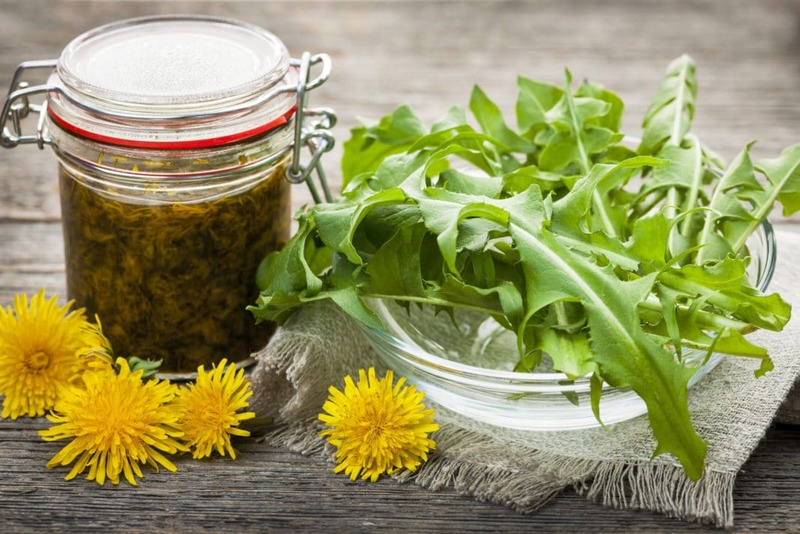 The recipe works best with young to medium-age (and sized) dandelion greens. Heat a good dollop of olive oil, and a bit of the garlic, in a non-stick skillet. Once the garlic has become flavorful, add your dandelion greens. Cook them on medium-high until they’re nicely wilted, just like you’d cook spinach. This will take 3-5 minutes. It’s important not to overcook the greens because you’ll lose nutrients the longer they stay on the stove. Once they’re done, sprinkle just a bit of high quality salt on the greens, spritz with fresh lemon juice, and you’re good to go! They’re wonderful to eat plain like this, as a side, and they’re also delicious on pasta. You can also add Parmesan cheese, red pepper, capers, chopped onion, or any other ingredients that strike your fancy. Sautéing dandelion greens is a great way to cook them because they keep a lot of their nutrients with this method. Boiling dandelion greens works better for larger, older leaves. The reason is because boiling the greens removes the bitterness, although it does take a bit longer. If you do decide to boil the leaves, be sure to save the remaining water. It’s not only full of nutrients, but it also aids your digestive system. When you boil the leaves, you’ll need to boil them twice. So drop the leaves in boiling water and leave them in for 2 minutes. Then drain the water (remember to save it for yourself) and boil again for 2 minutes. The double-boil method will remove a lot of the bitterness in older greens. If you’re boiling young greens, you’ll likely only need to boil them once. Once you’ve boiled your greens you can add butter or heavy cream and lemon for a creamy, delicious side dish! Fried dandelion flowers taste similar to morel mushrooms. They’re very tasty! Soak the dandelion flowers in a bowl of cool salt water to remove any bugs or debris. After they’ve soaked for around 1/2 hour, take them out of the water and gently blot the excess moisture away. Heat enough oil to fry the dandelions you have. While the oil is heating, make a batter using the milk, salt, egg and flour. Dip each flower into the batter, and toss it into the oil once it’s popping hot. Fry until they’re lightly browned. Use a paper towel to gently blot away excess grease, and serve immediately. Yum! Ok, I know many of you are going to look at this recipe with a raised eyebrow and a high dose of skepticism. But people have been roasting dandelion root as a coffee substitute for centuries. I have a bag of dried dandelion root in my kitchen right now, and I can tell you that it truly does taste like coffee. The biggest difference is that dandelion root is more bitter (tasting much like New Orleans’ style chicory coffee). It’s also caffeine free, and contains more antioxidants and nutrients than regular coffee. Roasting dandelion root is really easy. It’s best to dig up the root in the spring, which is when the roots have the most nutrients. Once you’ve dug up a fair-sized pile of dandelion roots, wash them in the sink or in a bucket of water. They’ll be full of dirt, so you’ll likely have to scrub them a few times to get all the dirt off. While you’re washing, preheat your oven to 250 degrees. Once the roots are clean, chop them into small chunks. Then put them in a bowl of water and scrub them one more time. Place the roots on a cookie sheet and put them in the oven to dry. Leave the oven door open slightly to let moisture escape. You’ll want to stir them frequently to make sure they’re drying evenly and they don’t burn. The drying process will take at least two hours. As the roots dry they’ll shrink and turn to a pretty brown color. Make sure they don’t burn! Once the roots are roasted, let them cool completely. Then, store them in a sealed glass mason jar. To make the coffee, use 1 teaspoon of roots for every cup of water. You can put them in the coffee pot, or put them in a tea infuser and add boiling water. In my opinion, adding hot milk takes away the slight bitterness and makes for a truly wonderful cup of dandelion coffee! These are just a few of the basic recipes I use when cooking dandelions. There are a ton of other recipes online, many of which are far fancier than these, that you could try. I’d love to hear back from you about this! Do you have any dandelion recipes you’d like to share?